Google Alerts inform the user about news from specific geographical areas. How can this useful service be used more efficiently? Google Alerts compiles information based on search terms that can be defined. The services informs via email when there is a new search hit. In this way your favourite subjects are up to date. The price for comfort: You feed Google with personal data that the search giant uses to provide you with target oriented advertisements. To set an alert open ‘www.google.in/alerts’. Fill the input field, give your email address and click ‘Create an alert’. The function is activated only after you click the link in the confirmation message. To receive the suitable hits, search for different terms with Google Search. You receive a message if a new hit for your search term is found under the top 10 messages or 20 search results. It is sensible to restrict the search term through many suitable queries to avoid receiving a vast number of messages or missing important messages, if the search terms are not popular. 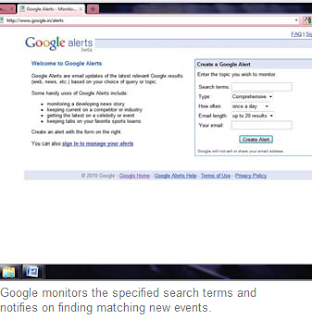 If you have a Google account, open ‘www.google.com/alerts/manage’, to manage the notifications. However you will first need to login to your account to manage this. There you will see active alarms that can be ‘edited’, ‘deleted’ or you can even create a new alarm. Users without a Google account can stop the service through an unsubscribe link in each notification but no longer adjust.